This Vegan Flourless Chocolate Cake Recipe is easy to make, gluten free, and is made with better for you ingredients to make a slightly healthier, fudge-y cake! If you’re looking for more vegan desserts, you should also check out: vegan raspberry oatmeal bars, vegan scotcheroos, black bean brownies, and more! Mondays call for chocolate, amiright? Orrrrr amiright? Mondays in January, call for chocolate that’s sliiiightly healthier, because we’re all still goin’ strong on our New Years Resolutions ;), but a girl needs her chocolate. That means, today, I have for you, this incredibly amazing Vegan Flourless Chocolate Cake Recipe. A chocolate dessert that’s lightened up a bit, but still tastes freaking amazing? Although I’m not a vegan, I love experimenting with vegan baking. What I love even more? Having people who cringe at the word “vegan” taste test vegan baked goods, and watching how much they love it. My favorite thing about this particular vegan recipe? This is a flourless eggless chocolate cake recipe! First, let’s talk about how easy this Vegan Flourless Chocolate Cake is to make. 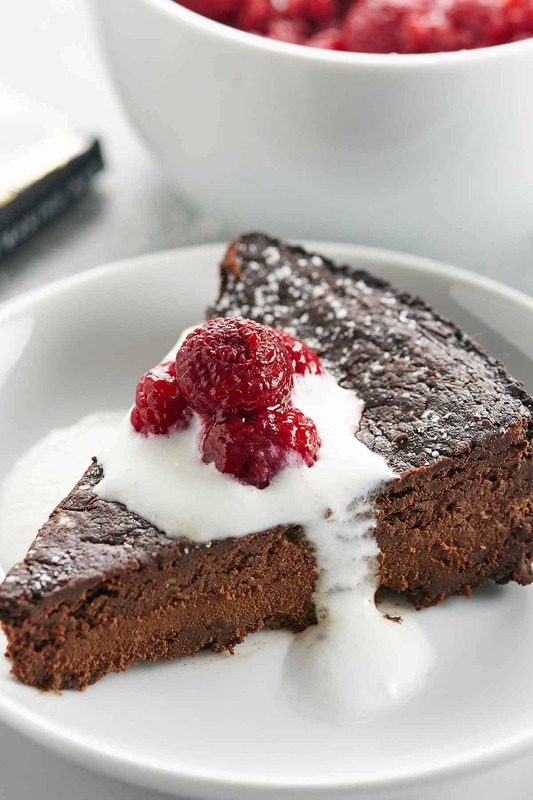 How do you make a diary free vegan flourless chocolate cake with coconut oil and pumpkin? Place cocoa powder, brown sugar, pumpkin puree, maple syrup, vanilla, and salt together in a bowl. Set aside. Melt together coconut oil and unsweetened chocolate (we used Ghiradelli 100% Cacao Unsweetened Chocolate Baking Bar). Whisk together the coconut oil/chocolate with the other ingredients. Pour into a spring form pan and bake. Let cool completely and place in fridge to set overnight. Now let me explain why you need to let this set overnight. I know it’s kiiiiind of annoying, because I mean, let’s be real, when that chocolate craving hits, you need chocolate like n.o.w. But you guys. This vegan flourless chocolate cake is well worth the wait. When I pulled this cake out of the oven, let it cool, and taste tested…it tasted ridiculously delicious, but the texture wasn’t quite right. So I placed it in the fridge overnight, and it really firmed up and became this crazy fudge-y, rich, perfectly chocolatey dessert. Seriously. It’s perfection. There’s chocolate and someone out there has said that chocolate is good for you. 😉 I, for one, am not questioning it. 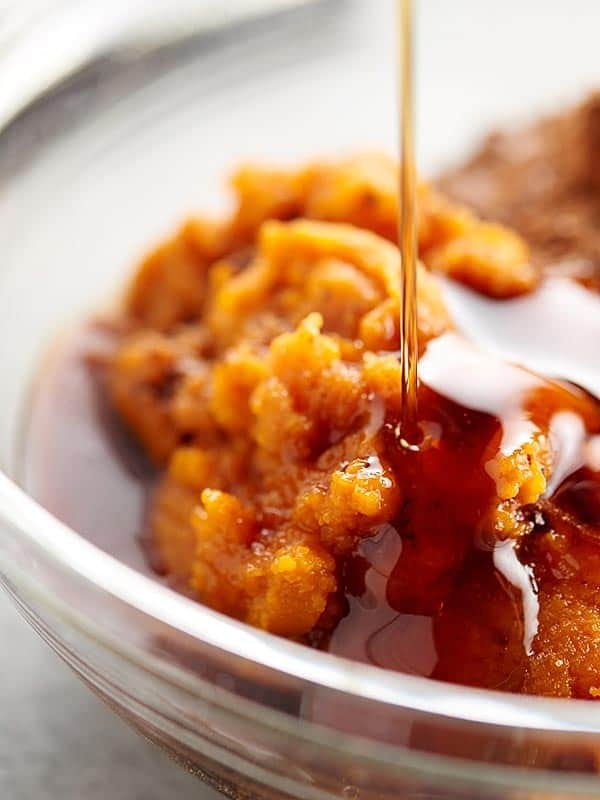 I use healthier, natural ingredients like pumpkin puree, maple syrup, and coconut oil! Lastly, and most importantly, let’s talk about this thing actually tastes. It’s perfectly sweet, extra chocolatey, and has the most amazing fudge-y texture. I’m in love. PS: I used this spring form pan (vs a cake pan), to make slicing and serving SO much easier. Do you want to see more vegan desserts? Show me the yummy! This Vegan Flourless Chocolate Cake Recipe is easy to make, gluten free, & is made w/ better for you ingredients to make a slightly healthier, fudge-y cake! Place cocoa powder, brown sugar, pumpkin, maple syrup, vanilla, and salt in a large bowl. Set aside. 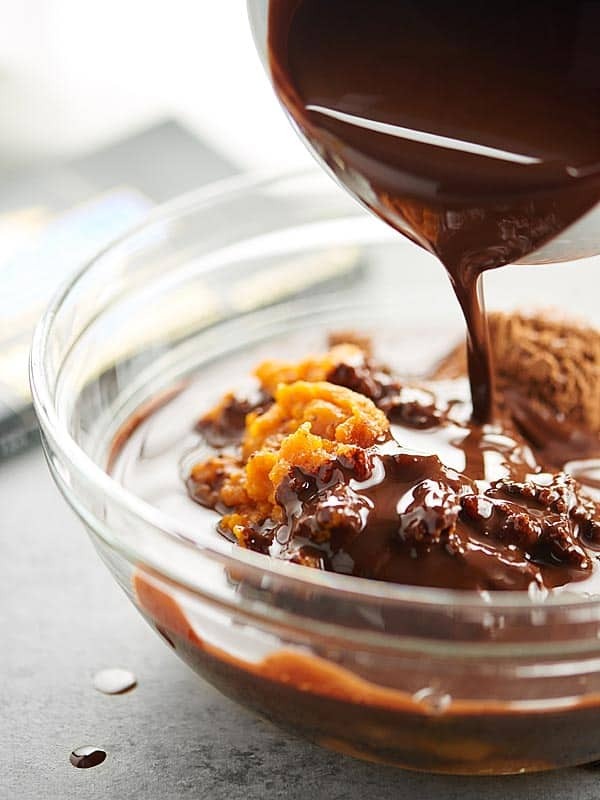 Melt the baking chocolate and coconut oil together in a saucepan over low heat, stirring until completely melted. Combine the melted chocolate/oil with the cocoa/sugar/pumpkin, etc. mixture. Whisk well until fully combine. Bake in preheated oven for about 60 minutes. Allow to cool in the pan for 15 minutes, then remove the sides of the springform, and allow to cool completely before wrapping in saran wrap and placing in the fridge overnight to firm up. 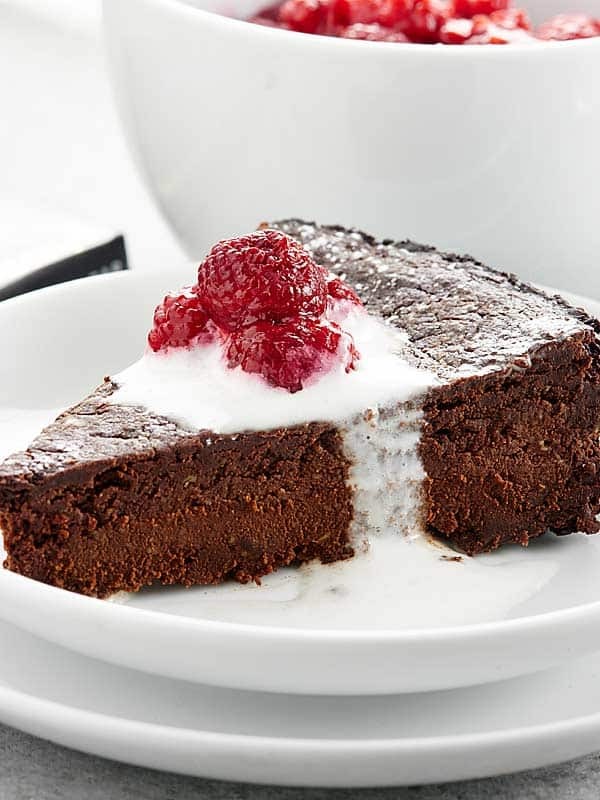 Once firm, serve immediately with a dusting of powdered sugar, raspberries, coconut cream, etc. *My cake dripped a bit, so I put it on the silicone lined baking sheet to catch the drips. Another awesome video! Love the frownie face! And the recipe sounds incredible too. I actually love vegan baking, but you made it into a flourless cake, which is a bonus. I am definitely going to try this. Thanks so much Julia!! Ha! The sad face was completely random…we thought it was so funny! 🙂 I hope you enjoy it! How are your pictures so BEAUTIFUL!!! Camera? Strobes? Is that even food? It has to be because my tummy is driving me crazy looking at that cake! Forever a fan! Vegan desserts get such a bad rap because when they’re done incorrectly they can just be horrible (I once had a vegan chocolate cupcake that tasted exactly like a stale Cheez-it, uncanny)! But this looks gorgeous and dense in the best, chocolatey way! I made this yesterday, thanks for the warning about using the silpat, I put it on a half sheet pan. There was quite a bit of leakage, probably the coconut oil, it was yellowish (from the pumpkin?). I let it chill for 24 hours in the fridge after trying a little chunk about 4 hours in. It is very rich! I would not call this a cake though. It is somewhere between a fudge and a candy. Maybe the most chocolate taste in a desert I have ever made. I am not vegan or gluten free but I wanted to try to make something to give my friends that are. I think if I made it again – I would lower the unsweetened chocolate by a third. It is so rich I want to stick a scoop of vanilla ice cream on it to break-up the intense flavor. Of course that goes against the whole vegan approach. It is pretty intense on its own, it needs a pairing to break up the huge chocolate hit. It is tasty though! I just don’t know enough about vegan cooking yet to know what to pair it with, maybe the raspberries in your photo, or a berry sauce. Maybe an orange compote. I will try a tweak in the future, but as a recipe it really looked like something I wanted to make and I am glad I did. I had no idea pumpkin could be a base for a vegan dessert. It got my wheels going in taste for sure. I will make it again! Hi Brian! I’m a HUGE chocoholic, so I love that it’s rich. 😉 I hear what you’re saying with this being called a cake, a lot of flourless cakes I’ve had are super thick. The tart raspberries and coconut cream that I paired with this, really help to round it out and cut the richness, so I’d definitely suggest trying those! Thank you so much for making it and I’m glad you enjoyed it. 🙂 PS – They do make vegan ice cream and you’re right ice cream with this would be outta this world good! Hi thanks so much for this recipe. I just made it and took it out of the oven.is it supposed to be a little running on top? Is that what you meant about the texture/ consistency thing? Just tasting a little bit of the batter was amazing. Hi Maria! The top shouldn’t be runny… I’m sure you’ll be fine though. My guess is that the coconut oil didn’t get mixed in fully. 🙂 I’m so glad you liked the batter…I hope you love the cake just as much! I really want to make this for my boys, I know they would love it! However, I have one that has to watch his carbohydrates per meal. Could you please tell me the nutrition for this lovely dessert that is making my mouth water? I am going to try this ! Can I substitute coconut oil with something else ? This cake is SO easy to make and tastes wonderful. I taste tested after it came out of the oven, but the patience of waiting for it to chill overnight is DEFINITELY worth it. Just tried it again this morning and it’s even better with its new fudge-y texture. This maybe a stupid question since most cakes can be made into cupcakes, but I’m asking because of the runny-ness that some have experienced. I would like to know if these could be made into cupcakes using liners? My son’s 2nd birthday will be coming up soon and I would like to make these for the children at daycare. Have you tried doing cupcakes? If so, do you have any suggestions? Thanks so much!! I bake for my vegan daughter and experiment with many wonderful ideas. This looks yummy. Just wondering if I can substitute agave for the maple syrup. Do you think the texture would be the same? Can’t wait to try it. Hi, sounds fantastic to me, but some of my guest do not like pumpkin. Do you taste the pumpkin at all? Thanks for the great suggestions for garnish. Hi Lance! No, you cannot taste the pumpkin. 🙂 I hope you love it! Would using vegan semi sweet chocolate chips ruin the cake? I am not able to find the 100% cocoa and feel a bit anxious using that strength! Hi Aarthi! Semi sweet will definitely be fine, but then I’d maybe omit the brown sugar. You can always add the brown sugar back in if it’s not sweet enough, but then I’d start with 1/4 cup brown sugar and go from there. 🙂 I hope that helps! Thank you! So excited to try! My family usually smirks when i make “healthier” desserts! Can’t wait to leave them wanting more flourless cake! Update: The cake was a super duper success! I found a 4 oz 82%cocoa and then used the semi sweet chocolate for the rest. For those who thought it was too much chocolate, try a good quality semi sweet (Simple truth brand from Kroger). My family was floored and I am trying not to eat the whole thing! I paired it with cashew milk ice cream (Kroger) and fresh mangoes. I took your advice and started with 1/4 cup of sugar and then added about 1/8 cup more. Thank you for posting this recipe as I can finally enjoy a flourless chocolate cake without all the abdominal distress! Now back to my midnight slice while my babies sleep!!! TRULY HEAVEN! Yay!! Aarthi, you just made my day 🙂 I’m SO happy you all enjoyed the cake so much. I can’t wait to try it with some cashew milk ice cream – oh my gosh, yum! Thank you so much for the update! I see coconut “butter” in the video. I only have clear coconut oil, is this OK? Well shoot, I didn’t read the recipe correctly and don’t have overnight to wait for it to firm up. More like 3 hours 🙁 Any suggestions? Maybe a quick stint in the freezer? Hi Flora! Sorry for the delay, we were traveling all day yesterday. How’d it turn out? 🙂 I’d say a quick stint in the freezer would do the trick! I only have a 10 inch spring form pan… This k it would be OK to 1 1/2 the recipe? I wouldn’t mind the “cake” being a little higher since I plan on baking it as a Bday “cake”:). Your thoughts? It looks great, I really want to try it, but i dont have maple syrup nor agave. Can i simply use sugar syrup, i.e. sugar dissolved in water on flame. Please help me. I want to make this cake for my husband’s birthday. Thanks. Not sure if I did anything wrong but geeze were these greasy. I even cut the coconut oil down to 3/4 cup because 1 cup seemed like a lot. Once I added the pumpkin, the water in the pumpkin puree and the oil separated and I had about a half cup of oil and water left in the bowl after I scooped out the batter. Even after baking and cooling, it left a big greasy ring behind. I couldn’t serve this. I triple checked my measurements. Not sure what went wrong. Smelled fantastic. Hmmm my guess is that the batter just wasn’t fully mixed, because if you watch the video above, it shouldn’t end up greasy at all! 🙂 Thanks for trying it!! Help! My cake is boiling and bubbling like greasy bacon and there’s only 5min. left on the timer! Worried this is going to be a greasy mess… batter was so nice… Is this how it should be at the end of the hour? Maybe it will settle down upon chilling? Ps. I agree that it smells delicious! Why bake for 60min instead of 10-20? It makes a big difference in flour cakes but since this is mostly oil and sugar, little changes in that time. At 50-60min the outer layer just begins to burn. If you want to scorch and harden the crust, would it work if after a few minutes of baking you turned on the top grill for short time? Other than that, the fudgy inner texture is nice. Hi Alan! The cake needs time to firm up in the oven, it’s virtually liquid after 10-20 minutes. If the outsides are starting to get too done, just wrap the outside of the pan in tin foil. 🙂 I hope that helps! Hi, thank you for the quick response and the foil tip. I used less maple syrup and oven baked pumpkin so I think I had less moisture in cake than you did (the pumpkin puree in can probably has more moisture). There was nothing inside to evaporate during the 50+min of baking. The oil itself doesn’t reduce during that time so like gabrielle mentioned the cake bubbles the whole time. That means that it’s the cool coconut oil that makes the cake firm and not the extra baking time? I think it would even be good raw. I also used a glass round pan instead of dark metal pan that you did. This is outstanding! It’s really closer to vegan fudge than cake. I served it with vanilla cashew milk ice cream. Extremely rich but simply delicious. Made this for my son’s first birthday party as I had some people with gluten allergies and egg allergies. It was a complete hit! I subbed butter instead of coconut oil only because I had no coconut oil and we aren’t vegan. Thanks for the recipe. Delicious. Definitely a small piece type of cake. Hi Erin! Yay!! So happy you loved it 🙂 Glad to hear it works with butter! Hi Jennifer! Is there a way to sub honey or more maple syrup for the brown sugar? We’re not eating any refined sugar currently and would love to find a workaround for this recipe! Ahhh, what went wrong? I followed the recipe as written but my cake looks nothing like cake. I opened the fridge to find a whitish layer of hardened coconut oil covering the surface. Under that layer is spoonable-only fudgy stuff. HI! I’ve been looking for a recipe for my daughter’s 17th birthday. She is on a Candida diet and high histamine diet and has many food allergies right now (that I hope will go away after we’ve healed her gut) so it’s been challenging to find something to fix for a birthday treat. Anyway, yours will work except for the coconut. Have you ever tried substituting ghee? Thanks for the help! Hi Jennifer! This resume looks great and I’m going to attempt it this evening. I do have one question for you. We are going to be traveling tomorrow and you say “once firm, serve immediately”. Will the cake hold up during a 1-hour car ride? If so, would it then survive being put back in the freezer or would you advise keeping it in the fridge until we’re ready to eat? I’m trying this recipe today for a friend’s baby shower and discovered that I don’t have pumpkin puree, can I substitute bananas? This cake is amazing. Made it for my daughter’s birthday because her son is violently allergic to eggs. Everyone totally raved about it. My wife said it was the best dessert I ever made and wants it for her birthday. Almost like eating a chocolate truffle. Great job! One thought. Might there be a way to add some coffee into the cake? I made this cake last night. Is there any indicator after baking for an hour that it’s actually done? I completely mixed all the ingredients before baking. I pulled out the cake after 60 min, let it cool for 15 min, then flipped it out of the pan onto cooling racks. The cake started to spread and I knew it would’t hold. I managed to get it back into the pan (not pretty) and after it cooled I placed the pan into the fridge overnight. In the morning I tried cutting the cake and it was still soft, but there was a cost around the outside. How do I know that it’s set enough after baking? Hi Patrick! Hmm. I never had the problem of it spreading. Did you bake it in a springform pan? No I used a regular cake pan, but the spring form wouldn’t have helped once I cooled it for 15 min, it still would have spread. How do you know the cake is done after 60 min? Try it with a spring form like I did next time. It really makes a difference. The top of the cake won’t be glossy, and you should be able to insert a toothpick and have it come out *almost* clean. I’d also suggest watching the video. It shows you the texture. I would like to make this for my mom, who is pre-diabetic has had to avoid sugar. We have monkfruit sweetener (1:1 substitute for white sugar). Do you know if I can substitute the monkfruit (which should function the exact same as regular white sugar) in place of the maple syrup & brown sugar? Or would that change the consistency too much? I think it would probably be fine, but I can’t guarantee the results because I’ve never tested it. 🙂 Sorry I couldn’t be more helpful! Just made this and I was astounded how easy it was! First vegan Thanksgiving and experimenting with different recipes! I made this for Thanksgiving and covered it with a vegan ganache (dairy-free chocolate chips and vegan coffee creamer, melted together) poured over the chilled cake. Unfortunately, the cake ended up out of the refrigerator longer than expected and got a little too soft (making me wonder if I’d baked it long enough), but the leftovers were AH-Mazing! Since there were no eggs, the possibility that it was underbaked wasn’t a safety concern, and that was a big plus for me. I generally follow a low-fat vegan diet, so this was a lot of fat from all the coconut oil, but I enjoyed the heck out of it and will definitely consider making it again. I may reduce the fat and increase the pumpkin next time, but then I’m never happy unless I’m playing around with a recipe trying to “improve” it. LOL. I made this for Christmas dessert, and followed the recipe exactly. It turned out good! but I think it could be better. My question is, at the end of the 60 mins of baking, about 1/3 of the top of the cake was still bubbling. Should I have baked it another 5-10 mins until all the bubbling stopped? That portion of the cake that bubbled actually ‘fell’ and was very greasy, and I had to dab it with a paper towel to soak up extra oil. The batter mixed very well and tasted great, so I’m not sure why one portion of the cake didn’t do well. My oven temp is calibrated, I used the correct pan. Any thoughts? The texture was fine, although the ends were getting a little crunchy, which is why I didn’t want to extend the baking time. Should the cake (or a portion of it) still be bubbling at the end of the baking time? Could applesauce replace the coconut oil? You could maybe replace half, although I can’t guarantee the results, because I haven’t tried it. Not sure how the texture would be. Can I use squash instead of Pumpkin? I substituted the coconut oil for vegetable oil, and the baking chocolate bars for semi sweet chocolate chips. While it was cooking a pool of oil formed over the cakes haha! My roomie and I drained out the oil and I think the cakes will still taste great but we were wondering if this oil separation happening with you? Hi Sara! Did you use a spring form pan? Separation has happened for some, but mostly it should just re-absorb back into the cake. Would butter instead of coconut oil work (even though it would no longer be vegan)? Also, have you ever used raw cacao powder instead of cocoa powder? I’m thinking of trying that and butter. I’ll probably cut the brown sugar down and use some stevia also. Well I finally got around to trying the cake with the changes that I mentioned earlier. So I used raw cacao powder instead of cocoa, 1/4 cup loose brown sugar (non packed) plus 3/4 tsp. stevia, and butter (not margarine) instead of coconut oil. My pan is a 7 inch so the batter filled it right to the top. I worried that it would take longer to bake because of being so deep so I added 20 minutes bake time. I used the silicone mat as well; thankfully. I let it cool in the pan for almost an hour because it was a bit jiggly still after 15 minutes, then ran a knife around the edge before removingthe sides. Voila! Beautiful! It was so hard to leave it until it had chilled overnight but I did and we all thoroughly enjoyed it the next day. ☺ Thanks for the great recipe. 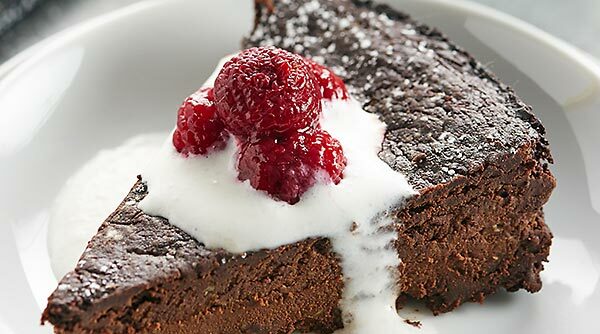 Absolutely the best vegan flourless chocolate cake recipe that I have tried. I paired it with some orange zest and topped it with a mango purée and it was absolutely amazing. Wahoo!! Thanks so much Kim! LOVE the idea of the mango purée on top!